This bracket is going to be wrong. At least a quarter of these teams won't hear their names called on Selection Sunday. Very few of the ones who do will be seeded where they are here. But the season starts tomorrow, and I want to lay down a marker so that in March I'll be able to point to one or two of those names and tell everyone how smart I was, and so that other people can point to some of those names and tell me what an idiot I am. It's fun for everyone! One thing that really jumped out at me when putting this bracket together was just what a geographic nightmare this year's host sites are. With both of the western first weekend pod sites in the far northwest, it sets up a scenario where a whole bunch of western teams--including Arizona--actually have Omaha as their nearest host site. And without a whole lot of quality teams out west this year--only Gonzaga seems a serious contender to be a top-15 team who might actually want to play their first weekend in Seattle or Portland--there's a high likelihood that the four pods played at those two sites are going to be headlined by a bunch of 4- and 5-seeds from the east coast who've been shipped out west by default. In short, there's going to be a high premium on getting a top-3 seed this year, and if you'd like to stay close to home, you're better off being a 6-seed than a 5-seed. Things don't get much better the second weekend, either. With the East Regional hosted in Syracuse and the South Regional in Houston--about as far west as it can possibly be played--the number of teams who want to flee to the Cleve includes over 40% of the teams in Division 1, and almost half of the TAPE top 100. I'll have more on this later, but here's a fun visual: get a map of the continental US. Draw a line from the point where the Florida-Georgia line runs into the Atlantic to Vancouver, BC. Draw another line from the point where the Potomac River meets the Chesapeake Bay to Niagara Falls. Every school between those two lines is closer to Cleveland than to any of the other 3 Regional sites. 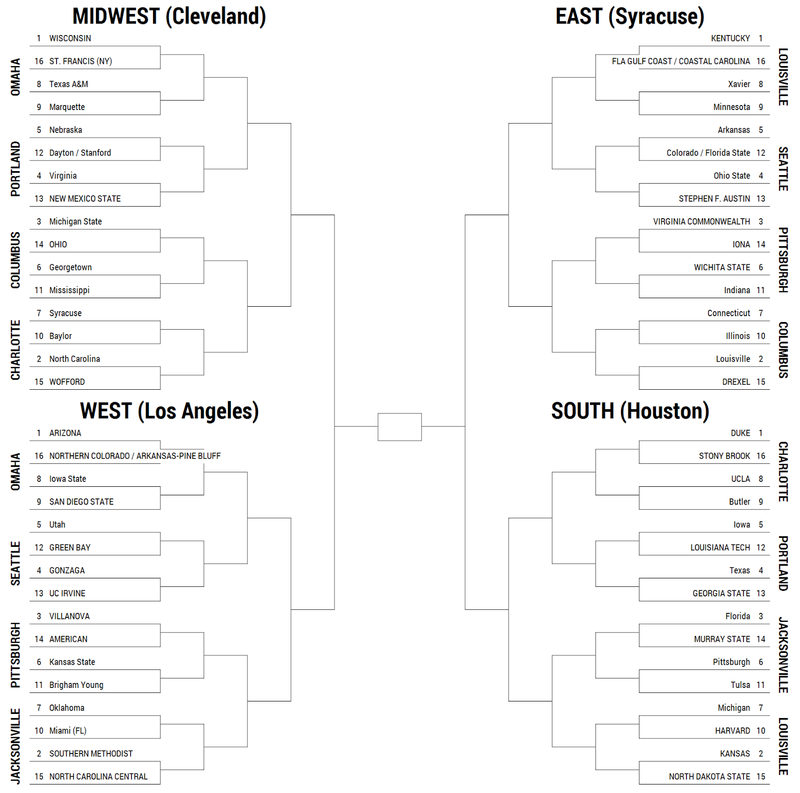 Get ready to hear about the Midwest as the Region of Death come March.